Developed from the Hughes 369, this was one of the three competing aircraft that underwent flight evaluation for the U.S. Army/Navy LOH program. The aircraft was originally designated YHO-6A until it changed in 1962. Resources related to the YOH-6A Cayuse, provided by the Vertical Flight Society. 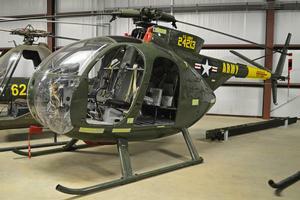 Resources related to the YOH-6A Cayuse, provided by public sources across the internet.